I found out about a week ago that Gretel gets to fly with me to Knoxville, Tenn. when I visit the PetSafe headquarters. I’ve never flown with a dog before, and Gretel has never been on a plane, so we were going to have a lot of preparing to do in two weeks time. The first thing I had to do was research the pet policy for American Airlines. I was lucky because American Airlines takes reservations for in-cabin pets. A lot of airlines fill the available in-cabin pet spots on a first-come-first-served basis. I suppose it’s rare that more than two people want to fly with their pet on any given flight but if you don’t show up really early you could risk being turned away. I was overjoyed to hear that American Airlines allows up to is seven in-cabin pets per flight – two in First Class and five in Coach and/or Business Class – because I was sure there would be room for Gretel on such short notice. Then I read the fine print and freaked out a little again. The flight we are on is operated as American Eagle and those flights only allow two pets in the cabin. Yikes. I called ticketing and they were able to reserve a spot for Gretel on all legs of our flight no problem though (it almost seemed too easy though so I am still a little anxious). The next step was finding a carrier for Gretel. 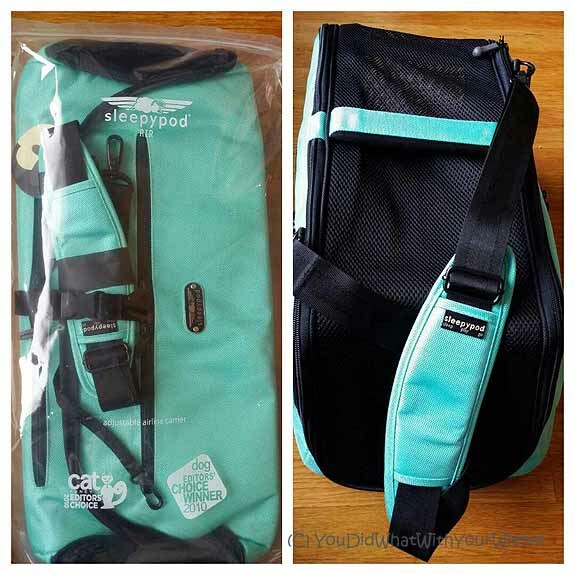 My friend Mary-Alice from the Dog Jaunt blog – a website with a wealth of information about flying and traveling with a small dog – came to the rescue and said she had tried a Sleepypod Air and knew it would be perfect for Gretel. Sleepypod is a brand I have had my eye on for a long time. Their products are high quality and beautiful to look at. I never had a good reason to get one though. That is, until now. Yay. It came a couple of days ago (I will be writing a review when Gretel and I get back from our trip) and I was happy that Gretel hopped in it to check it out as soon as I took it out of the box. 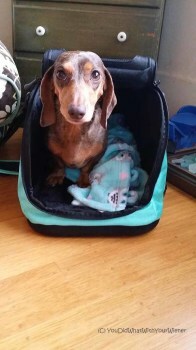 I know that the proper thing to do is slowly introduce her to the carrier – slowly getting her used to spending more and more time in there and to being carried around in it. We ain’t got time for that! We fly out in 5 days and 3 of those days are going to be spent camping. I am going through a SUPER abbreviated process of getting her used to it. Luckily, she tends to take whatever I throw at her but I don’t want her to become afraid of it. I’ve been filling her favorite Waggle treat toy, putting it in the carrier, zipping her into it, and leaving her in it until she has gotten all of the treats out. I’m extending the time she is in there after she is done bit-by-bit. It occurred to me yesterday that I might want to have the vet check her out before to fly to make sure there isn’t anything that would put her at risk. I called the vet and they asked me if I needed a health certificate. Yikes again! I hadn’t even thought of that. American Airlines requires a valid health certificate for pets flying in cargo but I was confused whether I needed one for a pet flying in-cabin so I got one just in case. I wish I had found Dog Jaunt’s chart that lists every airline and whether they require a health certificate or not before I panicked because I would have known that I didn’t need one. I would rather be safe than sorry though so it’s no biggie. Now the mission is to find the perfect bag as my second carry on (the pet carrier counts as one personal carry-on items) that will fit my computer as well as all of the stuff I think I will need to take care of (distract and potty) Gretel during the flight. Since Gretel’s carrier is going under the seat in front of me, my second bag has to go in the overhead compartment. I am really nervous about putting my fragile, expensive computer up there. I am trying to find a non-bulky case with rigid sides I can put it in to protect it inside of my bag. I’ll also need to research where the potty stations are at the airports we will be visiting. Again, Dog Jaunt has that information for a lot of airports so that is the first place I am going to look. I used to fly a lot, and I’ve never been on a plane with a dog. One time there was a cat. So it makes sense to me that you would have gotten an easy reservation even with a two-dog limit. Thanks so much for the shout-out, Jessica — I’m delighted that Dog Jaunt was a good resource for you, and I’m standing by if/as more questions arise. Have fun with Gretel!! That really brings back memories of the last time I was on a plane. It was 1992 and we were in the process of moving from Michigan to Florida. Hubby was already in Florida working and I remained in Michigan for a year waiting to sell our home. My daughter and I decided to fly down to spend Christmas with Daddy. We had a brand new Doxie puppy at the time and decided to take her along on the flight to meet her Daddy and see her future home. We had “Tara” under the seat per requirements. Then the stewardess noticed her and asked to see her. So I took her out of her crate and gave her to the stewardess. We didn’t see Tara for the rest of the flight because all the passengers wanted to spend time with her. So she was being passed around the entire plane before coming back to me just before landing. She was able to look out the window during the landing and was really interested in seeing all the lights over Disney World at night as we flew over. I will be following this, I want to fly with my Truffles, who is a mix of min-pin/dachsung rescue and has never flown with us before. We want to do some extensive traveling and do not want to leave her home for so long. I love the photos, I will pick up the SleepyPod Air for Truffles, seems that its comfy. Mom has flown with cats in the cabin and she took me at 9 weeks old. It is no big deal really, and for her less stressful than when we had to go in the cargo hold to move over here. As long as we are in the cabin she doesn’t mind. I howled and howled in the gate area, but once the plane moved I fell asleep but woke up on landing because of my ears. I’m sure it will go just fine. I just wish I could still fit under a seat so I could fly again. I hope your trip went well and your girl enjoyed traveling. 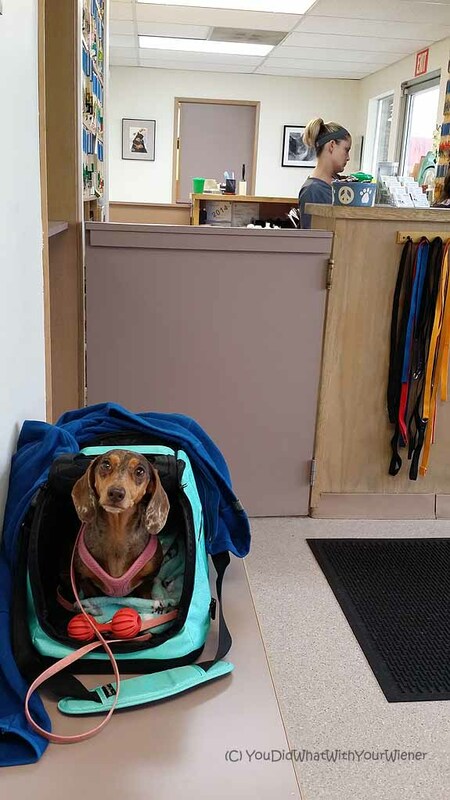 My husband and I travel with our Dachshund, Pearl, about six times a year to our home in Scottsdale, AZ. She is a seasoned traveler and knows the routine. I make sure I have treats to feed her on take-off and landing so that there are no issues with her ears. When traveling, we check in at the airport first, then let her have a potty break before going through security. I am sure you found out that you have to carry your pet out of its carrier without collar/leash, through security. Then they will swab your hands checking for explosives. Pearl likes making friends with the TSA agents. Once we land, we take her for a potty break before we do anything else. You check he websites of individual airports to find their pet relief areas. Not all airports have good spots for pets. Enjoy traveling with your dog.